This course relates principles of environmental science to our daily activities, with an eye to sustainability, conservation, and systems thinking. It introduces science as a process of inquiry and discovery rather than just a pre-established set of facts. Topics relate to energy, water, and land use, and include food, electric power, materials, buildings, transportation, and waste. 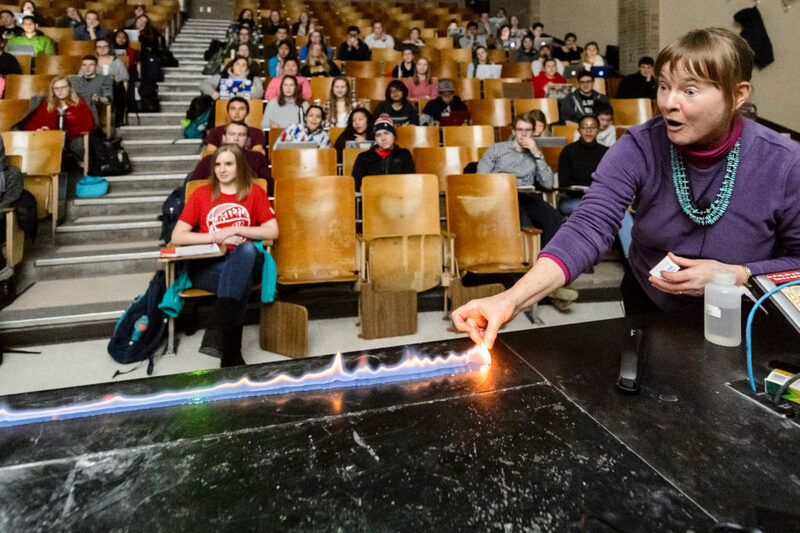 This course is “very ILSy” in addressing two interdisciplinary topics: energy & food on the UW-Madison campus. For example, what’s the big picture relating to our energy use, including lighting, vehicles, waste, and even the Charter Street heating & cooling plant? Where does our campus food originate, what is its carbon footprint, and what happens to food waste? What initiatives are now underway by WE CONSERVE and by the Office of Sustainability? Each week, a laboratory investigation that originates in our teaching space at the Wisconsin Institutes for Discovery will help you to find answers to questions such as these. Although this course meets the physical science breadth requirement, you’ll find that it contains a dash of the humanities and social sciences as well. This is introductory science course for non-science majors provides an overview of scientific discovery and the nature of science. It will explore science as a process of inquiry through five broad scientific concepts representing a range of disciplines: astronomy, geology, chemistry, biology, and ecology/atmospheric sciences. well as into our expectations of scientific knowledge and the scientific enterprise. This is an interdisciplinary, cross-college course that will bring together Theatre and non-Theatre students, scientists and non-scientists. The aim is to introduce students to ways of encountering science and art so that one can think critically about why these two domains have for so long been seen as separate and even mutually excluding, and how one might bring them back into some sort of dialogue. While the title of the course suggests the main trajectory (“Theatre”), there will be room for students to pursue collaborative research and projects based in art forms other than theatre: spoken word, multimedia art, installation art, applied theatre, and the like. Taking these definitions as versions of what critical thinking is or can do, we will examine critical pieces of writing and other forms of expression from Western, colonial, and post-colonial experience, asking ourselves what part the simple act of thinking critically had in the most important events in our history, and honing our own writing and thinking skills along the way. Material for the class will include texts and artwork from the history of colonization and independence in the Atlantic Rim, seminal works from the contemporary avant-garde, important speeches from the American Civil Rights movement and the radical youth movements of the 1960s, as well as a variety of other examples of truly critical human thought and expression. Through a semester of careful investigation of the power of critical thinking, students will be asked to broaden their own ideas of what their own writing and thinking have the capacity to do or become in the world. Assignments for this course emphasize the development of written and oral communication skills essential for a variety of kinds of real-world success, as well as academic excellence. This course fulfills the Communications B requirement. Western science and technology in the making. Major developments viewed in philosophical and social context from the 17th to early twentieth century. Students will learn a lot about the connections between commerce, manufacture, exploration, and war, changing conceptions of man’s place in nature, and our ability to control the world around us. And, in the process, we will come to a new understanding of the relationship between science, technology and society. Cannot be taken by students who have taken History of Science 202 or 404. ILS 202 offers an introduction to the history of the sciences between the late seventeenth century and the early twentieth century, with the aim of understanding the varied ways of knowing that have come to be known as “science.” We will ask: What does it mean to know something about nature? How can we be sure this knowledge is secure? And what is this “scientific” knowledge of nature good for, according to people in particular times and places? In pursuing these questions, we will treat such pivotal intellectual developments as Newtonianism, the conservation of energy, and Darwin’s theory of evolution. At the same time, we will seek to understand the relationship between these ideas and the broader cultural context in which they took place, paying particular attention to the ways it was possible to “do science” in different times and places. These big, messy, important questions and relationships are among the most important in our culture’s history and remain central to understanding the condition of modern Western and global culture today. The class meets three times a week, twice in one-hour lectures and once in a discussion section led by a TA. Attendance is required in lectures and discussions. Note that this course conveys Natural Sciences breadth credit for L&S. If you wish to take a similar course for Humanities breadth credit, consider signing up for History of Science 202, which meets with ILS 202 for its lectures (but has different emphases in discussion sections and assessments). ILS 203 is a survey of Western literature and art from classical antiquity to the medieval period, with a substantial emphasis on the textual and material remains from ancient Greece and Rome. 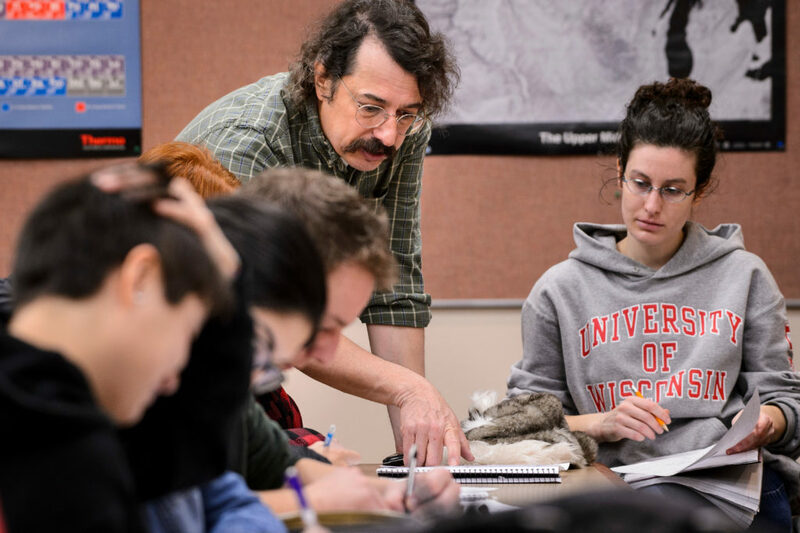 It will provide a foundational knowledge of some of the works of art and literature that have shaped the Western intellectual tradition, as well as challenge students to contextualize their own attitudes and beliefs. The development of literature and the arts from the Renaissance to the modern period: such figures as Shakespeare and Michelangelo through T.S. Eliot and Picasso. Literature and art in the context of society and ideas. Overall, the focus of the course will not be on “art appreciation” but on how cultural contexts – the ideas and values regarding religion, philosophy, political thought, social practices, aesthetics, and related fields – shape and make possible the various expressions of Western art and literature during this period. The class meets three times per week: twice in approximately one-hour lectures that I will lead (Tuesday and Thursday) and once on the day assigned as your Discussion Section and taught by your teaching assistant. Attendance is required at lectures and discussions. Course objectives include providing students with a broad overview of the major trends and periods in Western literature and the arts, as well as the contexts in which these movements occur, that is, within the history of ideas and culture from the West’s early modern period to the present. Examples of painting, sculpture, architecture, drama, poetry, fiction, music, intermedia art, street art and other expressive forms are placed in the historical context of prevailing and/or resistant cultural values and ideas. Plus, you’ll do much better on the “Arts and Culture” questions for “Jeopardy” and “Trivial Pursuit”… Overall, the focus of the course will not be on “art appreciation” but on how cultural contexts – the ideas and values regarding religion, philosophy, political thought, social practices, aesthetics, and related fields – shape and make possible the various expressions of Western art and literature during this period. Emphasis is placed on integrated learning across the arts and humanities. Students will be encouraged to look critically at the results of Western civilization even as they are invited to admire its many achievements. As well, projects are designed so that students can work independently and creatively with the material learned in class. The objective of this course is two-fold. First, this course introduces students to the basics of Western political, economic, and social thought. Through a careful reading of canonical texts, the elementary symbols and concepts of Western thought will be discussed. Our second objective is to learn how these symbols and concepts can be brought to bear on contemporary problems and how they can inform questions concerning our own political and social order. What part, for instance, does reason play in our world? What does a good citizen look like? What is the good human life? What is the place of violence? What does justice look like? Thinkers such as Homer, Thucydides, Plato, Aristophanes, Aristotle, and Augustine may be considered. The development of Western political, economic and social thought from the Reformation to the present day: the origins, logic and evolution of liberalism, Marxism, and organic conservatism as the principal systems of thought of the modern age. Through a careful reading of canonical texts, the elementary symbols and concepts of Western thought will be discussed. From these readings, student will learn how these symbols and concepts can be brought to bear on contemporary problems and how they can inform questions concerning our own political and social order. This course introduces students to the basics of Western political, economic, and social thought. Through a careful reading of canonical texts, the elementary symbols and concepts of Western thought will be discussed. From these readings, student will learn how these symbols and concepts can be brought to bear on contemporary problems and how they can inform questions concerning our own political and social order. What part, for instance, does reason play in our world? What does a good citizen look like? What is the good human life? What is the place of violence? What does justice look like? Thinkers such as Machiavelli, Luther, Rousseau, Kant, Smith, Hobbes, Nietzsche and Heidegger may be considered. Writing intensive course based on the conventions in which Western writers have expressed religious ideas. Readings from Jewish, Christian, and other spiritualities. This course introduces some key aspects of Jewish, Christian, and Islamic thought and historical experience by exploring a range of texts from antiquity to the modern era. We begin by considering major themes in the sacred scriptures of each religion – themes conveyed via such literary genres as narrative, law, prophecy, gospel, epistle, apocalyptic, and poetry – with a focus on ways in which later texts interact with earlier ones. The middle unit of the course examines different approaches, in the medieval and early modern periods, to knowing and experiencing the divine. We will consider how monotheistic thinkers drew on Greek ideas about reason and knowledge, and we will read bits of philosophical theology, mystical writing, and polemical treatises on the nature of religious and intellectual authority. In the final course unit we will read two spiritual autobiographies and a novel to explore relationships among religious tradition, identity and the search for meaning in the modern world. portray the complex interactions between science, society, and culture. You will find that ILS 251 requires a team effort. You ore part of this team. We need your steady participation over the course of the semester, your collaboration with others, and your input about what best con help you to learn. Remix refers to the practice of altering an original song by adding, subtracting or modifying elements to create a new experimental work. This idea can also be applied to all forms of media, whether a text, artwork, video, or photograph. The process of remixing broadly understood dates back to the ancient world where authors and artists sought to imitate, adapt, and improve on earlier models in order to create new meanings. This course explores examples of remixing from ancient Greek lyric poetry to contemporary Hip Hop. This is an interdisciplinary, cross-college course that will bring together Theatre and non-Theatre students, scientists and non-scientists. The aim is introduce students to ways of encountering science and art so that one can think critically about why these two domains have for so long been seen as separate and even mutually excluding, and how one might bring them back into some sort of dialogue. While the title of the course suggests the main trajectory (“Theatre”), there will be room for students to pursue collaborative research and projects based in art forms other than theatre: spoken word, multimedia art, installation art, applied theatre, and the like. Students will read or view a variety of plays that address scientific themes and characters. As well, we’ll view and discuss more contemporary multimedia (sometimes virtual) art/theatre/installations with scientific form and/or content. These primary materials would be supplemented by short, layperson-accessible essays on scientific ideas, sometimes supplemented by video material on particular ideas from physics, cosmology, cognitive science, biology, and genetics. The course will be delivered via a mixture of lecture, video and image presentations, class discussion, a good deal of small group peer work, and some interactive lab activities that combine scientific and artistic pursuits. Evolving and contested concepts of justice and equality are an integral part of American public life – they play a key role in mediating our relationships with one another and with the state. But where do these ideas come from, and, as significantly, what kind of real-world impact do they have on the lives of individuals hailing from a diverse array of racial, ethnic, cultural, and socioeconomic backgrounds? Moreover, how are narratives about justice and equality rendered in American culture, and how do such stories reflect and/or influence the way we live today? This interdisciplinary course examines such questions by engaging a variety of narrative texts, including the first season of the award-winning HBO drama The Wire. The critical inquiry sparked by these works will allow us to focus our discussion of justice and equality on four broad areas: economics and poverty; race and ethnicity; law and public policy; and the criminal justice system. One of our main goals throughout the semester will be to chart the overlaps and interconnections between these realms – the complex and sometimes unpredictable ways in which they shape, and are shaped by, one another. To help us make meaning of these linkages, we’ll scrutinize the ways in which notions of justice and equality are rendered in cultural forms ranging from scholarly books and articles to songs, films, TV programs, and podcasts. upon this corpus. In the second half of this course, we will focus on rabbinic topics. As one of the most iconic thinkers in early Western thought, Machiavelli’s writing comes across in so many of our ILS classes. This course hones in on the legendary politician-philosopher and the world that surrounded his intellectual atmosphere. An exploration of Christianity’s charter documents in the light of what modern scholarship has discovered about the New Testament’s sociohistorical context, composition, theologies, and presentations of Jesus. This class gives a thorough introduction to the literature and literary history of the Old Testament, Apocrypha, Dead Sea Scrolls, Talmud, and Midrashim; texts that have had an incredible amount of influence on the history of humankind. The objective of this course is to examine the ideas of political economy and to question how the economy should be connected to society. Within this broad objective, there are two specific areas of study. First, through a careful reading of several important works, we will endeavor to discover the philosophical origins of political economy. That is, we will set out to find not the beginnings of political economy as a process of policy making, but rather to uncover the theoretical motives and problems that give rise to political economy as a way of thinking in general. Second, we will explore a series of powerful critiques from theoretical quarters and vantages. In so considering these texts, we shall endeavor not only to discover how they address the optimism of modern thought, but also to explore the applicability of their arguments at the dawn of the 21st century. By the end of the course, students will be familiar with a number of major thinkers of political economy, including Smith, Kant, Marx, Polanyi, and Hayek among others. Students will also leave the course with the philosophical tools to judge contemporary interplay between society and economy. Should citizens in a free society have the right to own guns? Many Americans praise firearms for safeguarding citizens from criminals and tyrants, while others support restrictions on firearm ownership in the name of reducing gun violence. In the United States, this debate centers on the meaning of the Second Amendment, which protects the “right of the people to keep and bear arms.” This class will investigate the role of guns in American society from philosophical, historical, legal, and social scientific perspectives. Specifically, we will study the philosophical foundations of the right to bear arms, the importance of an armed citizenry in the political theory of the American framers, the original meaning of the Second Amendment, the history of firearms in America, the Supreme Court’s jurisprudence on the Second Amendment, and contemporary debates over gun control. Ideally, students will better understand the Second Amendment and its ongoing relevance to themselves and society. “Sports and Society,” examines a large question — what is the relationship between sports and political life? The course tackles this question by examining both theoretical texts and practice based accounts of sports in American life. Key questions include: How does watching sport inform the political and social realm? How does sport form community in democratic life? How are inequalities manifest in sport? What is the role of virtue in sports and politics? How are economic issues seen through sport? And finally, how do technological politics emerge in the realm of sport? “Conservatism” is a term used freely in today’s polarized political landscape, but what does it actually mean? This course evaluates the history of conservative thought within western society, blending philosophy, history and political science in a classical liberal arts approach to this partisan buzzword. Required Capstone for Juniors and Seniors seeking ILS Certificate. In a participatory seminar, we will explore the relationship between liberal education and leadership. What might Alexander Meiklejohn and those who motivated him–from Socrates and Kant to John Dewey, James Baldwin, Bertolt Brecht, and the justices of the U.S. Supreme Court–teach us about the often fraught link between critical thinking and civic engagement? 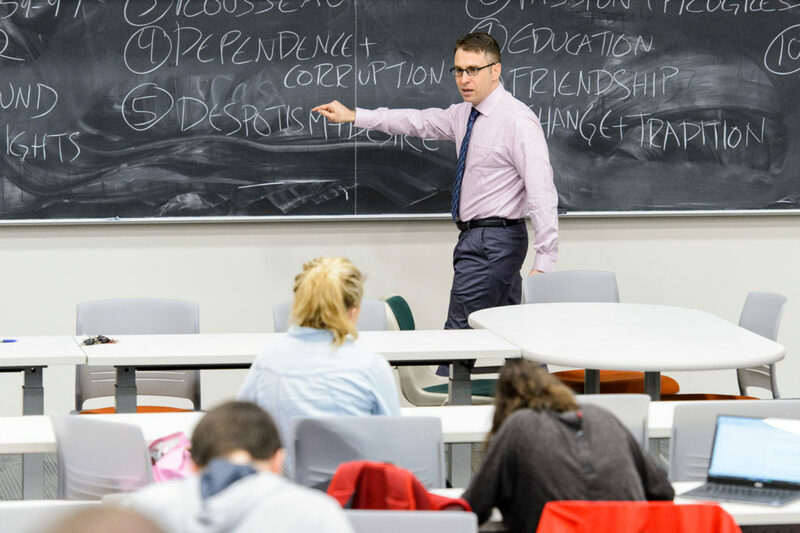 The first part of this capstone will generate a set of shared questions about liberal education and leadership; the second part will turn the course over to you to grapple collectively with the two weightiest questions Meiklejohn faced, namely, what and how to teach and learn in a diverse and democratic society. The senior capstone offers a chance to look back over your ILS education and forward to the many opportunities and challenges that await you. What will be your “ILS Toolkit” as you head into your future? B—Biological Science. Counts toward the Natural Science requirement.